Bronwyn Minton created this View22 piece from Karns Meadow in early July. She was paired this location because it is central to her “sense of place”, as she lives nearby and walks by it nearly every morning. Bronwyn is the Associate Curator of Art at the National Museum of Wildlife Art and has worked in a variety of mediums to create works that are often inspired by the complexity and elegance of the natural world. 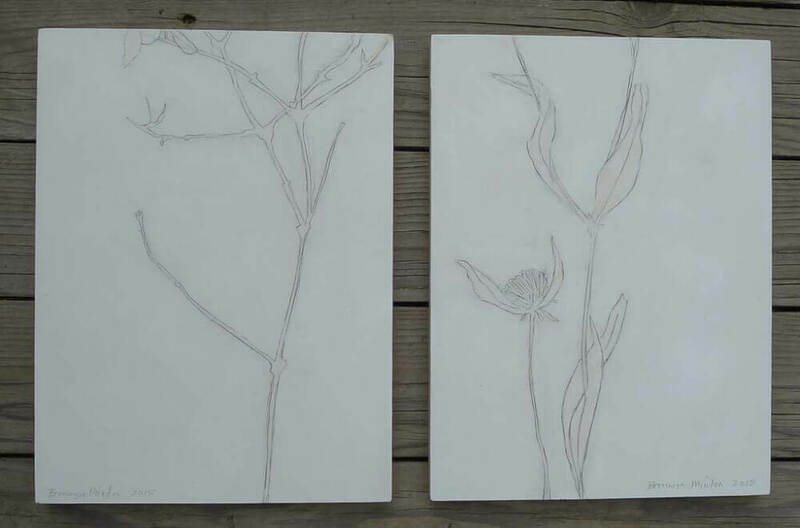 For View22, Bronwyn collected native plants from her neighborhood open space, Karns Meadow, to create a set of graphite and acrylic on board panels meant to be displayed as a pair. Later in July, Bronwyn returned to Karns Meadow as one of the local artists invited to collaborate with the Exquisite Gardeners for the Land Trust’s FoundSpace project, a community art installation to celebrate Karns Meadow, built from found objects gathered on Land Trust protected properties. View22: Open Studio Works Now Online! In 2016, we invited 19 local artists to create place-inspired art on 13 Jackson Hole Land Trust conservation properties. The momentum for the project built over the summer as artists created their works and interacted with the community at artist demonstrations at the Jackson Hole Mountain Resort and R Park. From August 1st -14th, the buzz continued building as the 13 View22 open-access locations were marked with green JHLT flags. 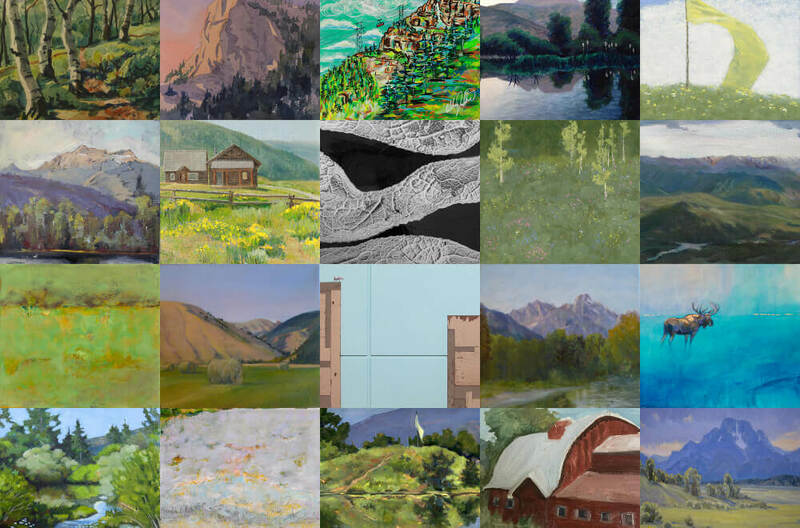 View22: Open Studio will culminate this Sunday, August 14th, 2016 with an exhibit and sale at the Jackson Hole Land Trust’s 36th Annual Picnic at the Fish Creek Ranch in Wilson. The 31 finished works are now available for viewing and purchase online and through our downloadable e-catalog! The catalog will be updated periodically to reflect sales. For inquiries regarding art sales please contact Roxanne Pierson at roxanne@jhlandtrust.org or 307-733-4707.
https://jhlandtrust.org/wp-content/uploads/2018/07/View22-Collage.jpg 2376 2200 imokweb https://jhlandtrust.org/wp-content/uploads/2018/04/JHLT-Logo-Parent-300x213.png imokweb2016-08-09 00:00:002016-08-09 00:00:00View22: Open Studio Works Now Online! For as long as I can remember, I’ve had a deep longing for a sense of place in my life. This is a strong theme in my art. To feel connected to a town, a street, a house. I’m painting today in Karns Meadow, where the Karns family once homesteaded through brutal winters in the depression era. I love to paint these old places and think about the memories they have held. This grassy meadow was once a sprawling ranch, a home to several generations of the Karns family. Now all that’s left is a few irrigation ditches and bits of old ranch machinery. Symbols of the modern Jackson Hole, including a beautiful solar panel array, power station, and Walmart-sized Start Bus barn are the main features I see now. I would love to paint the solar array someday. For now, I choose the vibrant green, red, and yellow of the grassy field. In the distance, the hazy sky has blurred the mountains into a soup of purple and blue forms, perfect conditions for my work. Normally, I’m all alone out here when I am painting. But today, about an hour in, a neighbor at the edge of the park walks up to me. The woman tells me that I’m standing in what was a field of dandelions in the springtime. Her family collected all of the dandelions and made wine with it, would I like some? I don’t drink, but am too embarassed to turn her down. People in this valley are so resourceful. Making wine from weeds! This painting session is scheduled for June 27th, 2014. Sign up to receive email updates from us to the right so you get our blog posts right in your inbox!